Spunlace Definition:What is spunlace nonwoven Fabric? 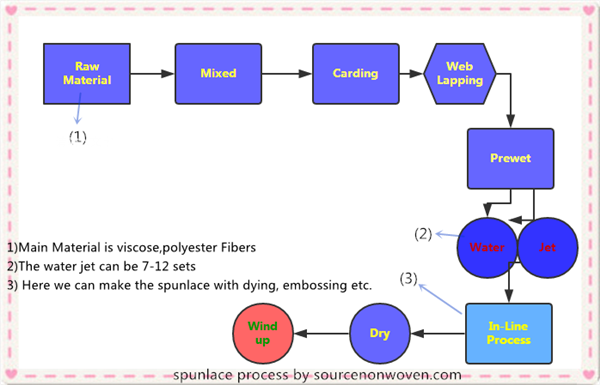 Spunlace (Also called Hydroentanglement) is a bonding process for wet or dry fibrous webs made by either carding, airlaying or wet-laying, the resulting bonded fabric being a nonwoven. It uses fine, high pressure jets of water which penetrate the web, hit the conveyor belt (or “wire” as in papermaking conveyor) and bounce back causing the fibres to entangle. 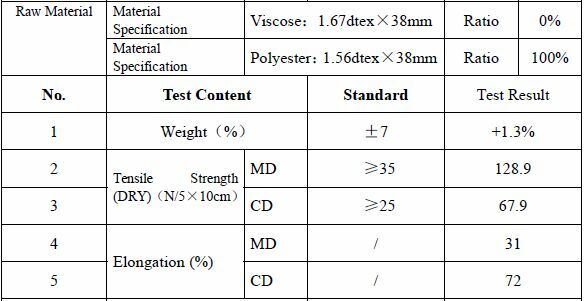 Spunlace non woven fabric used short staple fibers, the most popular is viscose(38mm*1.67dtex) and polyester staple fibers(38mm*1.56dtex). 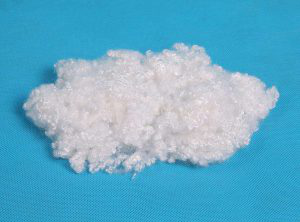 Sometimes Polypropylene (PP) also used in spunlace production. Some other raw material, such as cotton, tencel,chitin etc. These fibers are more natural and they are from plant or animal, which is more expensive. That is all about spunlace meaning you want to know. A spunlace productive line is several machine parts contains, like mixer machine, carding machine, water jets etc.. To invest a spunlace machine is big. The local China spunlace nonwoven machinery are mainly from Feilong, Zhengfangji etc. The famous one may be “ANDRITZ” in Europe. Based on technical reason, imported machine is better than Chinese machine, both output and fabric quality. Nowadays the most spunlace non woven fabric manufacturers are from US, Europe,China and Turkey, Vietiam, India and Indonesia also have the spunlace machines in currently years. But China should be the most complete types and export the most quantity every year. 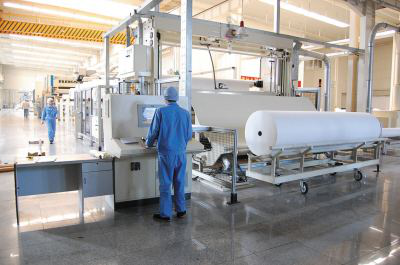 Hznonwoven now has 2 imported machine and 1 local machine, satisfied to different customer requirement. Flexible entanglement, does not affect the original characteristics of the fiber, does not damage the fiber. Appearance is closer to traditional textiles than other nonwovens. High moisture absorption, rapid moisture absorption. Also to produce the spunlace fabric, it is a big investment as mentioned before, the lines is very long and covers an large area. These wood pulp non woven fabric is cheaper and also a good material for spunlace wipers. The first table is cross lapping spunlace, which MD & CD is both higher than parallel lapping spunlace fabric. For easy understand, we have a photo to show you. The parallel lapped spunlace can easy tear straight with its vertical direction, and cross lapped spunlace is not so easy to tear, you can not tear it in a straight line. 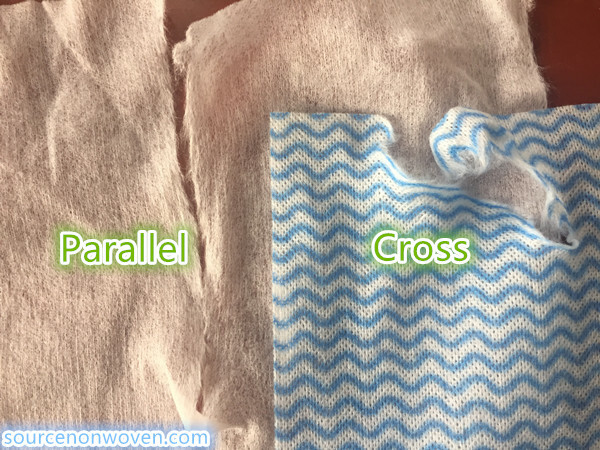 On this occasion, parallel lapped spunlace is mostly used for wet wipes, and cross lapped spunlace are more widely used as dry wiping cloths or leather etc. First of all, spunlace non woven fabric is mainly used for wipes: such as home, personal, beauty, industrial, medical wipes, etc. Too many Wipes both dry and wet are made by spunlace fabric. And also wound application materials: bandages, gauze, Band-Aid, etc. Third, spunlace fabric can make for clothes, for example clothing lining, baby clothes, training clothes, carnival night disposable color service, all kinds of protective clothing etc. 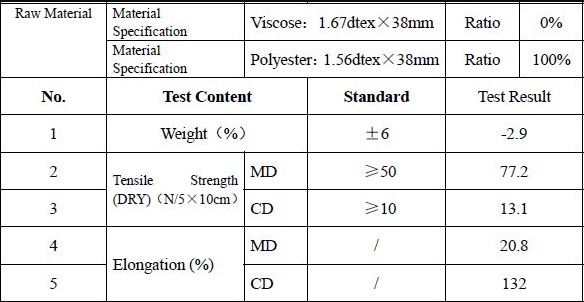 How to check spunlace fabric quality? Some customers told us that they received a wrong or lower quality spunlace non woven fabric. Then how do you check you received the right quality spunlace fabric? It is easy to test by the lab or costs money to by a 3rd party to do that. But here we show you the way to test in very easy way which you do by yourself. 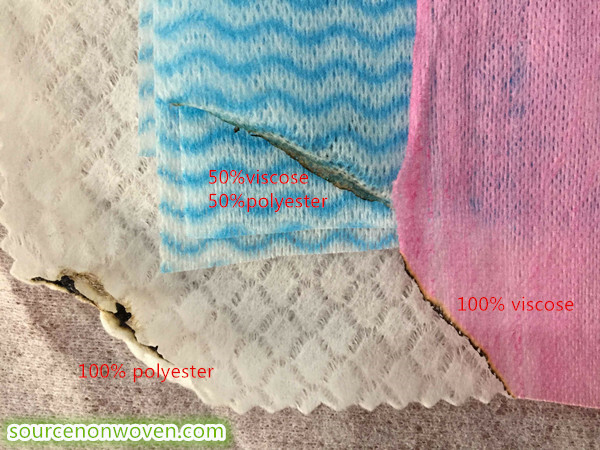 The most important for spunlace fabric is its composition, as viscose fibers is usually more expensive than polyester fiber, viscose made the spunlace better absorbent and higher quality for wiping. You can see the obvious difference during the burning. More polyester the fabric will burn more quick and it is not easy to exterminate.After burning, there is a black induration. But 100% viscose after burning it is only gray,no induration. So burn faster and more induration, then the fabric contains more polyester. We are the professional spunlace non woven manufacturer, we produce various of different spunlace fabric for customer requirement. Please contact us for your spunlace offers. 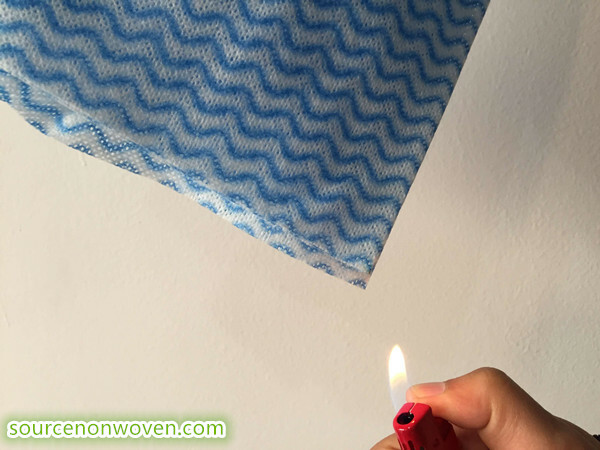 ← What is Non woven Fabric? my aim is to find a good machine suppliers for spunlace line. Thanks for the technical details. I wish to know if it can be used for fruit protective bags like grapes , bananas & similar ones to protect them from uneven environment conditions & insects. Thanks for your comments, Prasad. yes, the spunlace fabric can be also used for bags.